Several weeks ago when Thomas was here and we played in the clay together, I made some leaves out of stoneware to put on the table at Thanksgiving. I have been wanting to make some of these for a long time. So today, I glazed them and have them firing in the kiln. I am also experimenting with using some stained glass and adding it on top of the clay item and letting it turn to liquid in the kiln. I have never done this before and a friend at work who does stained glass gave me some of his scraps so that I have several colors to place on the leaves and on a plate and see how they do. I am hoping that on the leaves that the glass will liquify and run into the veins that I drew in the leaves. I used fall colors and am hoping that the reds will really work. The leaf is curved enough to hold the liquid glass and hopefully won’t run off onto my kiln shelves. On a few of them I put a shelf liner down to catch the glass in case it does run off. 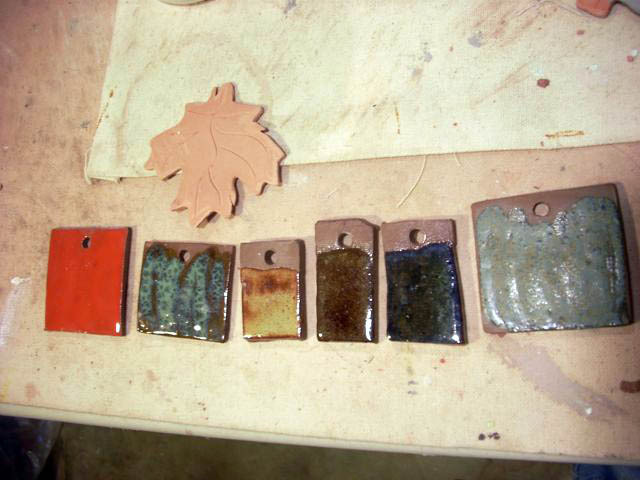 The glaze colors that I used are a fire engine red, a celadon, lustre gold, lacy mauve, and a metalic gold and agate. The glaze colors are on test tiles that I make when I get a new glaze so that I know how it is going to fire in my kiln and to use as a reference to know what the color looks like. I have lined out the colored tiles as you can see here, as my fall palette. I had made a platter with my fossil frog on it and am experimenting with the glass on this platter. 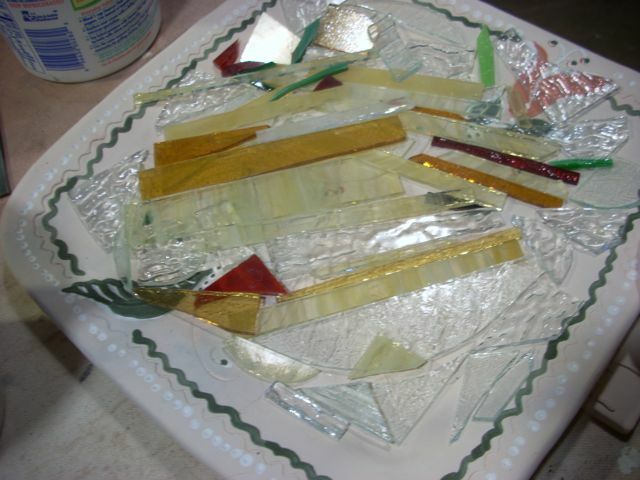 This is how it looks before it goes into the kiln with pieces of glass just laying on the plate. I am wondering if the colors will all run together or will they move together and mix. The kiln is then loaded with glazed items. 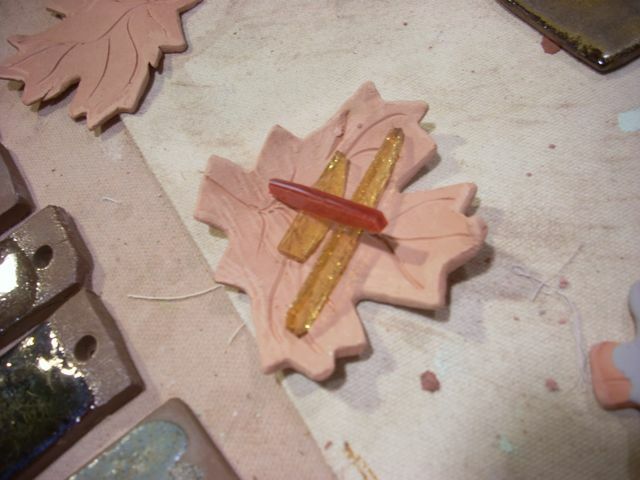 The leaves, the garden markers and a few of the frog tiles that I made at the same time I was working on the bench. In a glaze firing the pieces aren’t allowed to touch each other or the kiln shelf if they have glaze on their bottom sides. 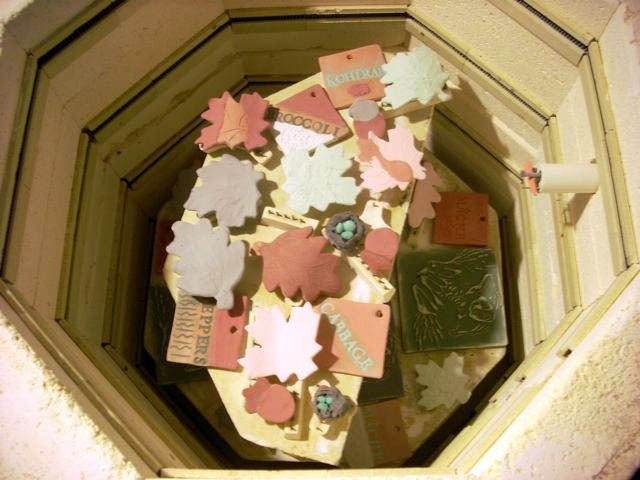 The leaves are sitting on little stilts and the markers and tiles are just sitting on the kiln shelf. The firing will go for about 7 hours. Late tomorrow (or maybe sometime Monday) we get to see how they look! Giving them plenty of time to cool so that the glass won’t crack when exposed to the air. Susie Morgan Wilburn • This entry was posted in glass, Holidays, recycled items, Thanksgiving, vegetables and tagged Arts, Autumn leaf color, Ceramic glaze, Crafts, Glass, Kiln, Thanksgiving, Tile. Bookmark the permalink.